Rizokarpasso (Greek: Ριζοκάρπασο) is a town on the Karpass Peninsula in the northeastern part of Cyprus. While nominally part of the Famagusta District of the Republic of Cyprus, it has been under the Turkish occupation since1974..
Rizokarpaso is the biggest town on the peninsula and is located half way between the small town of Yialousa and Apostolos Andreas monastery. Traditionally the occupants of Rizokarpasso were employed in agricultural pursuits. The soil near the town consists of terra fusca which is extremely fertile. Local crops include carob, cotton, tobacco, and grain. Before 1974, the town was predominantly inhabited by Greek-Cypriots. During the Turkish invasion of Cyprus in 1974, the peninsula was cut off by Turkish troops, and this prevented the town’s Greek-Cypriot inhabitants from fleeing to the unoccupied South. Rizokarpaso is now the home of the biggest Greek-speaking population in the occupied North. Although the Greek-Cypriot population is now mainly elderly and shrinking in size, they are still supplied by the UN, and Greek-Cypriot products are consequently available in some shops. 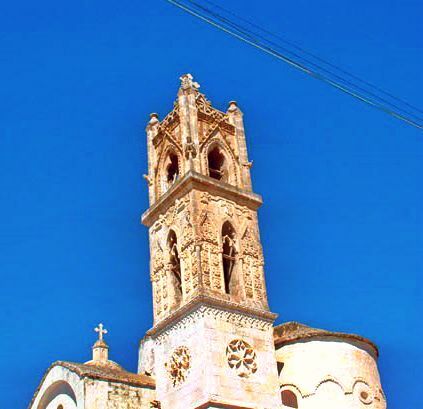 The town has two main churches: St Synesios the church of the Holy Trinity (Ayia Triada). They are examples of the typical Cypriot mixed style, combining features of the late Gothic introduced by the Lusignans with the late Byzantine style of the Orthodox tradition.. These are two of the few Christian churches to operate in the northern part of Cyprus, and has allegedly had services stopped by the Turkish Cypriot police.